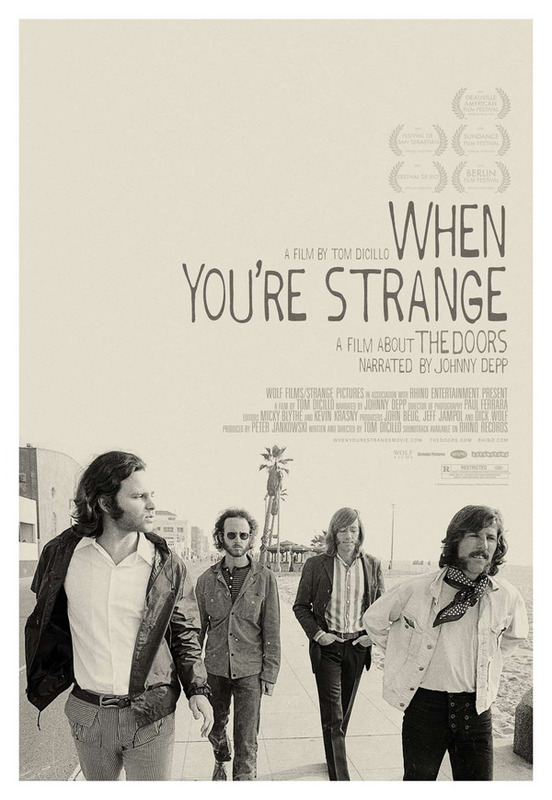 This big screen documentary follows the band The Doors from their formation in 1965 to Jim Morrison’s death in Paris in 1971 (he’s buried in the world famous Pere Lachaise Cemetery). Writer-director Tom DiCillo (JOHNNY SUEDE, LIVING IN OBLIVION) avoids talking heads retrospective interviews, with contemporary footage and still images throughout and a wry commentary read by Johnny Depp. It’s amazing that so much footage of The Doors at work and play exists (rare in the 1960’s), and there are even sequences from an unfinished underground film Morrison starred in. Di Cillo covers the bad behaviour many rock bands are famous for, but his focus is on the music and he even takes the trouble to analyse The Doors’ unique sound (no bass, extra keyboards) and to assess what other members of the band contributed to the mix. Ultimately, WHEN YOU’RE STRANGE is an essential film for Doors fans, but it’s enlightening to the uninitiated, too. Not only is there great music, it’s a compelling story of a troubled creator whose charisma was preternatural, and it captures a moment in time that will never be replicated.